← EM ONE – July Update – Shhhh… the baby’s sleeping! Practice Changer: The HEART Pathway is a simple cardiac risk assessment tool that is designed for use in the ED. It’s safe and effective at classifying patients as low risk for outpatient evaluation of cardiac disease while also decreasing length of stay and cardiac testing. The HEART score was described in the Netherlands in 2008 and retrospectively validated initially in a European Cohort, then in the United States at Wake Forest University where they retrospectively found the rates of MACE (Major Adverse Cardiac Events) ** at 6 weeks in patients with HEART scores of 0-3 to be 0.6% (5/904 pts). A prospective validation study confirmed the HEART score’s utility (see below). It was noted in the retrospective US study (above) that the addition of negative serial biomarkers to the HEART score decreased risk to 0% MACE at 6 weeks. Subsequently a 0 and 3 hour troponin has been added to the HEART score and termed the “HEART Pathway.” This pathway was found to have over 99% sensitivity for MACE as a secondary retrospective outcome of the 1000+ patients in the MIDAS trial (below). Earlier this year a prospective trial to describe benefits of using HEART was performed (below) showing no missed MACE and decreased length of stay and use of stress testing. 1. Prospective validation study of the HEART Score. Population: All Patients presenting to 10 EDs in the Netherlands with Chest Pain. Inclusion Criterion: All Chest Pain Patients. No age restrictions. Dyspnea and Palpitations were excluded. STEMIs were generally taken directly to the cath lab, so mostly excluded from analysis. 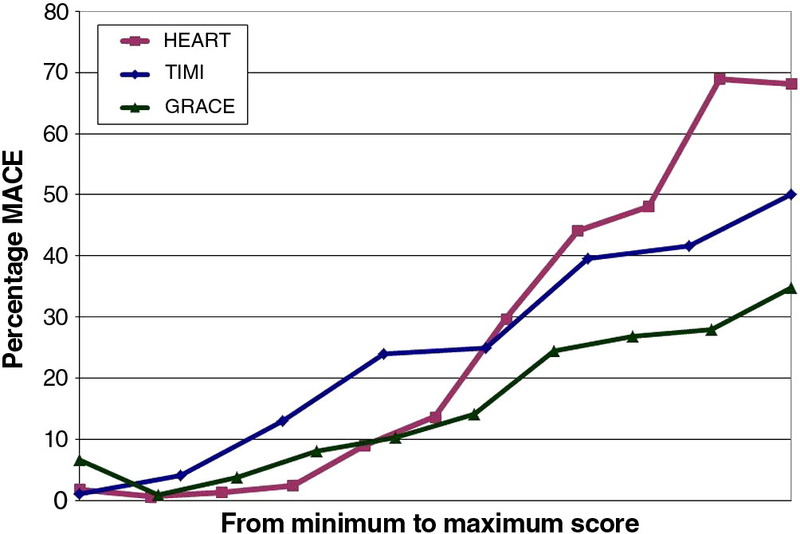 Data: HEART score, TIMI, and GRACE score was calculated for each patient. 1 point = bundle branch block, LVH, repolarisation abnormalities from digoxin or other repolarisation abnormalities. 2 points = any ST elevation or ST depression without BBB or LVH. Primary End Point: Major Adverse Cardiac Event (MACE) at 6 weeks. MACE =AMI, PCI, CABG, coronary angiography revealing procedurally correctable stenosis managed conservatively, and death due to any cause. Results: 2440 patients with Chest Pain of which 45 were lost to follow up. Conclusion: HEART score for chest pain patients at the emergency department provides the clinician with a quick and reliable predictor of outcome shortly after arrival of the patient, without computer-required calculating. 2. HEART PATHWAY – What about the addition of serial troponins? NACPR score by itself and with troponins at 0 and 3 hours. My Conclusions: The HEART score with 0 and 3 hour serial troponin identified more people for discharge and did a better job identifying high risk individuals than clinical gestalt. It also decreases the miss rate to <1%. Exclusions: STEMIs, Hypotension, non-cardiac source of symptoms discovered in ED. Intervention: HEART score with a troponin at 0 and 3 hours. If low risk, they were discharged to home with PCP follow up within 1 week. Control: Usual Care by ACC/AHA guidelines. Typically involving serial biomarkers and objective cardiac testing before discharge. Conclusions: Compared to usual ACC/AHA care, use of the HEART Pathway decreases utilization of health care resources. This entry was posted in Uncategorized and tagged Cardiology, HEART Pathway. Bookmark the permalink.